This year in the gallery’s Fringe show, an annual event sparked by the Edinburgh Festival Fringe (often referred to as simply The Fringe) which originated in 1947. It is the world’s largest arts festival, which in 2018 spanned 25 days and featured more than 55,000 performances of 3,548 different shows in over 300 venues. 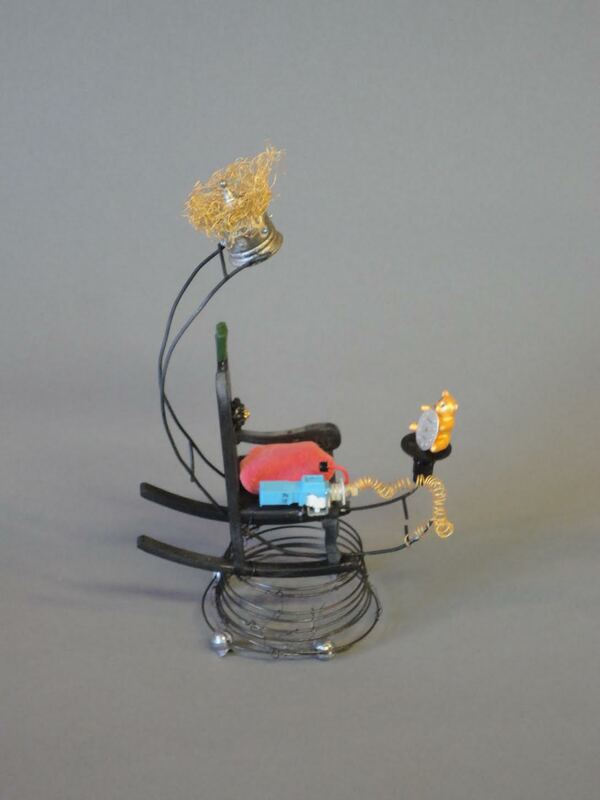 Partners Gallery is featuring a collection of unusual and ingenious chairs handmade or embellished by gallery members, including a Time Machine chair, collaged and painted children’s Adirondack chairs, a needle felted miniature chair with goose and a Temporary Tyrant Tiny Throne. 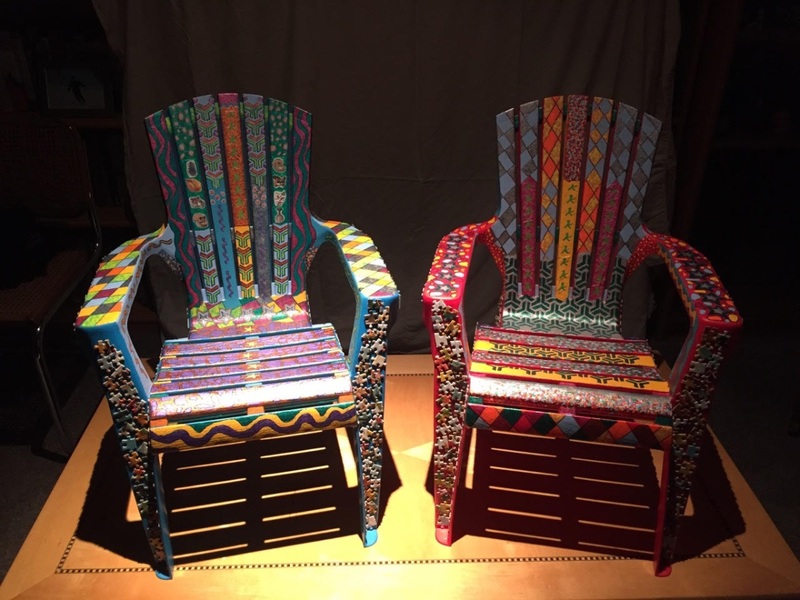 We will have an ongoing silent auction for the chairs which will end at 6:30 during our May 3rd reception. Partners Gallery is committed to hosting invitational and juried exhibitions from and for the community. 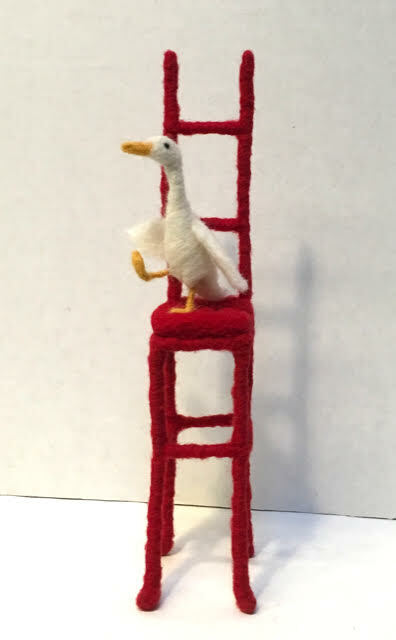 The auction supports this effort. Domestic art meets fine art – a provocative intersection of Fringe and the invisible labor made visible – when artists from Partners once again set up their ironing boards and do their ironing and mending. Visitors are invited to bring their ironing and mending, or just come to sit and visit and talk about their experiences and how to iron a shirt and whether ironing is a meditation or a chore. Partners Gallery is proud to present three California artists selected for a juried show on artistic responses to our current cultural conditions. The show is curated by Amy Berk of the San Francisco Art Institute where she has taught ”City as Studio Practicum” to SFAI students and similar programs for under served youth. Christopher Chinn’s paintings are inspired by the marginalized and dispossessed of Los Angeles and he has dedicated his artwork to sharing compassion for the homeless and a desire for social change. Christopher’s work has been included in numerous national exhibitions including MOCA and the San Luis Obispo Museum of Art. Brianna Eng focuses on the value of genuine relationship and human connectedness. She creates business cards and postcards that invite understanding and allow for being heard and reaching back in part through using paper that is touched by both the communicating individuals. Barbara Pollak-Lewis’ “Scream” and “Disaster” series depict reactions to our current political and social climate since the 2016 election, including the California wildfires and other environmental disasters. Emotions have always been a major component of her work. Partners Gallery is hosting a special jewelry show for the month of February, 2019. The gallery currently represents eight contemporary jewelers and is inviting nine additional artists for this show. Most are from Northern California but others hail from as far away as New York City and Montpellier, France. A variety of materials, techniques and styles are on display. Included are jewelers who use gold, silver, bronze and enamel along with pearls and a variety of beautiful and unusual gemstones. One artist makes rings solely with precious metal clay which transforms, when fired, to fine silver, copper and brass. Another creates dramatic fine silver pieces fused with 24k gold and silver dust. There are also imaginative pieces using sea glass, Victorian antiques, and even dried and pressed vegetables. Lia Vincenza’s ancient techniques meet modern styling. Her designs evoke crumbling ruins, rooftop gardens and glittering skylines. Precious gems and pearls, handwoven gold wire and an instinct for balance make for atmospheric jewelry that is timeless in design. Nancy Gardiner works with a particular attraction to Art Deco and art Nouveau styles. Her one of a kind jewelry, is much inspired by her elegant Grandmother. American by birth, Suzanne Otwell Negre has doubtless kept in her heart something of the landscape and extraordinary architecture of the Orient, where she grew up. Over all and under all are the dazzling light and the rich shade of villages in the south of France where she has made her home for over 30 years. Yvonne Giambrone-Martin has been creating jewelry in Northern California for forty years. Author mcohen15Posted on January 17, 2019 Leave a comment on Ocean Reflections – continues! Partners Gallery and five other Mendocino County coastal galleries are exhibiting artwork about the ocean during the month of January. This exhibition opened to a significant gathering of people supporting the preservation of the ocean, the coast, and artistic interpretation of the beloved waters. Paintings, sculpture and mixed media “Ocean Reflections” will be shown in Fort Bragg at Partners Gallery, Northcoast Artists’ Gallery and Fire Glass Gallery. In Mendocino, featured ocean-themed work will be a part of the Mendocino Art Center and Artists’ Coop of Mendocino exhibitions. The Artists’ Collective in Elk will also participate in this community effort. Our coast and ocean is a source of inspiration and creativity for artists in all mediums. Evocative work will be presented through a wide range of drawings, paintings, sculpture, ceramics, blown glass, light fixtures, vessels, jewelry, photography, paper & fabric constructions. Constantly reminded by its extraordinary beauty —yet wary of the risks and threats to our coast and ocean by repeated attempts to industrialize it—coastal residents have an emotional, sometimes spiritual, relationship with the ocean. Existential environmental considerations are crucial to our very existence. Most know the importance of a clean and healthy marine environment for our planet home to survive. Others focus on its magnificence. Since everything we do is in proximity to the ocean, we are constantly aware of its significance – both personally and collectively. The timing of the art exhibits calls attention to the expectation that the Trump Administration’s new Outer Continental Shelf 5-Year-Leasing-Plan will be unveiled in January or February. Trump has opened the prospect of oil, gas and mineral exploitation in all public lands, including submerged lands offshore. People are urged to write about their concerns when the time for public comments on the Outer Continental Shelf 5-Year-Plan is announced by the federal government. Everyone is encouraged to view the art on display in our galleries during the month of January. Give yourself an uplifting experience and see this short video about the dwelling of a member of the Gallery – in a unique environment! Author mcohen15Posted on December 14, 2018 Leave a comment on Gifts, Toys and more….